RBCC presents its 2014 Music Fest – from October 10 through 26, 9 different venues featuring 13 different bands & performers! 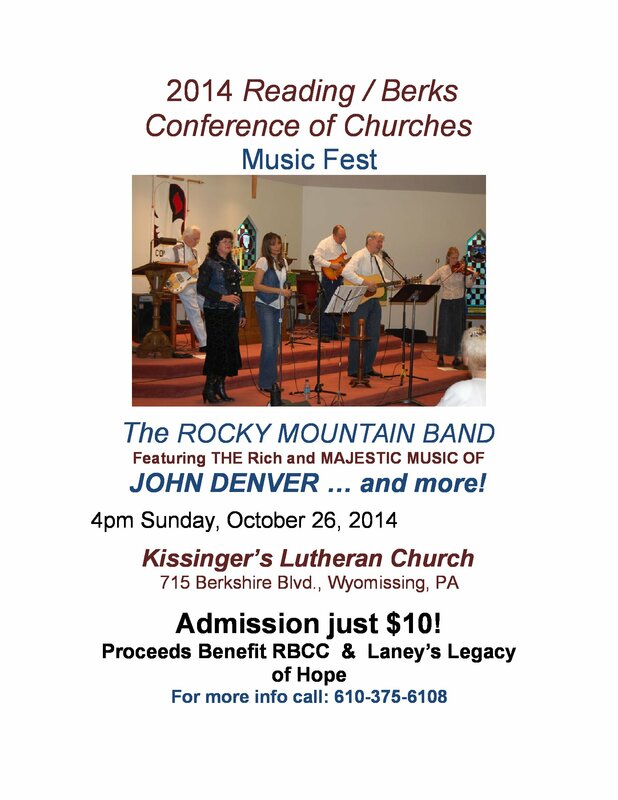 Lots of variety in style – from Elvis to John Denver, Praise to Rock, Folk to Showtunes! There is something for everyone! Proceeds benefit RBCC and 8 other ministries! You don’t want to miss this! 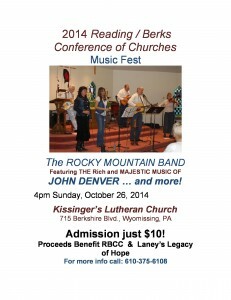 The Rocky Mountain Band is a John Denver tribute group that has been performing for about 10 years. The core group of David Reinwald, pastor of Kissinger’s Lutheran Church in Wyomissing, his wife, Jackie, and Lee Schappell, plus other fine musicians have raised money for several organizations including Reading Junior Academy, earthquake victims in Haiti, The Holly Heilman Cancer Fund, and for the family of the group’s percussionist, Randy Angelo, who passed away in December of 2012. They are excited to be helping the Reading Berks Conference of Churches this year. Part of the proceeds from this concert will also be going to support “Laney’s Legacy of Hope”, an organization created to help families with children suffering with high risk pediatric cancer. It is in memory of Delaney Brown who died on December 25, 2013 from cancer at 8 years of age.